Information behavior has emerged as an important aspect of human life, however our knowledge and understanding of it is incomplete and underdeveloped scientifically. Research on the topic is largely contemporary in focus and has generally not incorporated results from other disciplines. In this monograph Spink provides a new understanding of information behavior by incorporating related findings, theories and models from social sciences, psychology and cognition. In her presentation, she argues that information behavior is an important instinctive sociocognitive ability that can only be fully understood with a highly interdisciplinary approach. The leitmotivs of her examination are three important research questions: First, what is the evolutionary, biological and developmental nature of information behavior? Second, what is the role of instinct versus environment in shaping information behavior? And, third, how have information behavior capabilities evolved and developed over time? 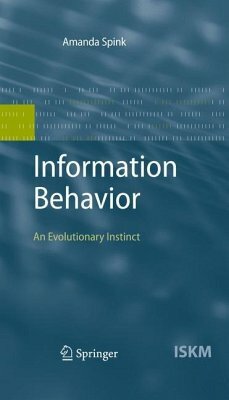 Written for researchers in information science as well as social and cognitive sciences, Spink's controversial text lays the foundation for a new interdisciplinary theoretical perspective on information behavior that will not only provide a more holistic framework for this field but will also impact those sciences, and thus also open up many new research directions. Amanda Spink is Professor and University Chair in Information Science in the Department of Information Science at Loughborough University (UK). She has a B.A. (Australian National University); Graduate Diploma of Librarianship (University of New South Wales); M.B.A. in Information Technology Management (Fordham University), and a Ph.D. in Information Science (Rutgers University). Amanda's research focuses on theoretical and empirical studies of information behavior. The National Science Foundation, the American Library Association, Andrew R. Mellon Foundation, Amazon.com, Vivisimo. Com, Infospace.com, NEC, IBM, Excite.com, AlltheWeb.com, AltaVista.com, FAST, and Lockheed Martin have sponsored her research. Amanda has published over 330 scholarly journal articles, refereed conference papers and book chapters, and 6 books. Many of her journal articles are published in the Journal of the American Society for Information Science and Technology, Information Processing and Management, and the Journal of Documentation. Amanda's research has been published at many conferences including ASIST, IEEE ITCC, CAIS, Internet Computing, ACM SIGIR, and ISIC Conferences. Her other books are Web Search: Multidisciplinary Perspectives, New Directions in Cognitive Information Retrieval, New Directions in Human Information Behavior and Web Search: Public Searching of the Web, also published by Springer, and the Handbook of Research in Web Log Analysis, published by the Idea Group. Amanda was ranked as the 8th Most Highly Cited Author in the Field of Information Retrieval [Ding, Y., Yan, E., Frazho, A., & Caverlee, J. (2009). PageRank for ranking authors in co-citation networks. Journal of the American Society for Information Science and Technology, 60(11), 2229-2243] and in 2008 had the second highest H-index citation score in her field from 1998 to 2008 [Norris, M. (2008). Ranking Fellow Scholars and Their H-Index: Preliminary Survey Results. Loughborough University, Dept of Information Science Report]. Preface: Information Behavior Challenge - Chapter 1: Introduction - Chapter 2: Information Behavior Framework - Chapter 3: Evolutionary Foundation - Chapter 4: Instinct versus Environment - Chapter 5: Human Cognitive and Social Behavior - Chapter 6: Lifetime Development - Chapter 7: Information Behavior Sub-Processes - Chapter 8: Information Behavior Over the Ages - Chapter 9: Key Propositions and Future Directions - References - Index.